Hallo, gute Ware und prommte Lieferung, gerne wieder. MFG R. Müller. 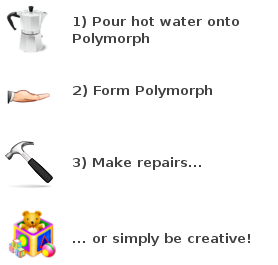 Polymorph is an ideal material for making and mending things. it can be reheated and remoulded any number of times. It is made mouldable by simply immersing it in water warmer than 62ºC. It can be moulded in many ways and stays workable until a much lower temperature. For emergency repairs whilst on holiday take along a small slab. All you then need is hot water either from the hotel or bar.